This lovely apartment lies within a Balinese inspired resort called Hibiscus Gardens, this little bit of paradise is just a mere 100mt’s from Macrossan street (main centre of town) where you will find boutique shops, restaurants, supermarkets and tour agents, everything is at your fingertips but far enough away for complete relaxation. You will be only a short stroll (approx 300mt) to the patrolled section of beautiful 4 mile beach and only a short walking distance to the Marina where the boats depart for the inner & outer reefs daily. Basically you are in the middle of everything!! Hibiscus 10 is a privately owned and managed apartment located within the Hibiscus Gardens resort on the cnr of Mowbray & Owen st. Port Douglas. **We offer you complete privacy, once final payment has been received you will all the information you require to locate and enter your apartment. *** This lovely 1 bedroom apartment is fully self contained not a serviced apartment, the apartment is fully made up for your arrival with fresh bed linen, 2 bath towels and a pool towels for each guest. There is an onsite laundry within the resort for your use. Beautiful, such a relaxing place to stay & so close to everything. Helpful staff too!! The room is just perfect, very inviting & cosy. The interior style oozes beachside vibes & the outlook to the pool was great. Loved every moment of staying at the Hibiscus! If you are looking for an apartment for 2 and like proximity to the shops and restaurants of Macrossan St and the uncluttered and patrolled surf beach , then chose this. Steps to apartment were an issue. Discuss on booking. Beautifully decorated apartment where the owners have thought of everything. All the little extras from bathroom and kitchen supplies to umbrellas (for the occasional evening downpour) and lots of fluffy towels.The design of the apartment allows for a gentle cross breeze which meant that fans were sufficient and we didn't need to use the air-con even on 30 degree days.The balcony area overlooks the lagoon pool and gorgeous gardens. The pool area can be a bit noisy during the day but we did visit during the school holidays so this is to be expected.Situation of the resort is ideal with easy walks to the beach, marina and town area. Check in and out were seamless and communication with the owners helpful and prompt. Everything you need for a relaxing holiday! 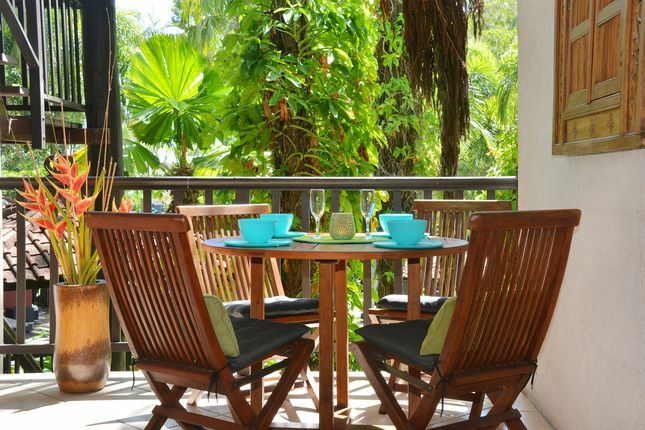 So glad we booked this lovely apartment on our first visit to Port Douglas. Well appointed and secure apartment in a small complex close to everything. Fresh, cool, beautiful bed and updated kitchen. Apartment overlooks pool and BBQ area, but quiet and private. Within metres of Macrossan St, Four Mile beach and Marina so no need for a car. Thoroughly enjoyed our stay. Great value. Thanks Barry and Linda.